Wouldn’t it be neat to have an at-a-glance display of common statistical information on your WordPress Dashboard? The StatDash plugin does exactly that, adding a customizable widget that shows stats from Google Analytics, Feedburner, Twitter and even your earnings from the Envato Marketplaces. You can choose which of the services are displayed, as well as hide the chart if you wish to have the widget be a bit more compact. StatDash is my first item to be released on Code Canyon. It’s priced at $8, and is GPL compliant of course. Yesterday I released my newest WordPress plugin: Tweetable. It helps integrate Twitter into your blog. It tweets your posts as they are published and adds a configurable sidebar widget that displays your latest tweets (with optional follower count). The automatic post-tweeting can be configured to use the URL shortener of your choice, and Google Analytics campaign tags can be included. Microsoft to launch beta of Internet Explorer 8 – Internet Exploder 8 is coming soon. Is Microsoft even listening to our protests about the <meta http-equiv="X-UA-Compatible" content="IE=8" /> meta tag? I will be talking about this insidious new “feature” more in-depth sometime in the next few days. 99 Sites ALL Designers Must Know About – There are plenty of familiar sites in this list, and quite a few ones that are new to me. The post lives up to its title; If you’re a designer, or an aspiring designer, then this post is definitely worth a look. Bad flavor: ICANN, Network Solutions sued for domain tasting – Why ICANN? Network Solutions was the one tasting the domains. Why should ICANN be responsible for a registrar’s nefarious activity? Navigation Menus: Trends and Examples – Navigational inspiration, Smashing-style. WordPress 2.5 Plugin Settings Pages Style Guide – If you’re a plugin developer, you may want to see this post. Voting has started for the 2008 Webware 100 Awards. Be sure to vote for WordPress! Top 10 Worst Captchas – Don’t make your Captchas like these ones! 301 redirects are useful for numerous things. 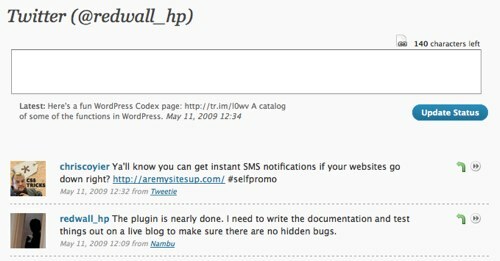 If you change a post slug is WordPress, then you can place a 301 redirect so anyone going to the old URL will be redirected to the new one. This had the added bonus of letting search engines know (when they re-crawl your site) that they need to update the URL they have stored. Others use 301 redirects when they use affiliate links, so no PageRank is passed on, and so if the affiliate URL changes, they can update their links by just changing the redirect target. There are plenty of ways to do 301 redirects. You can use the PHP Header() command, you can edit your .htaccess files (using the mod_rewrite feature), etc. Mod_rewrite is generally the most versatile method, but it’s a big pain in the neck. The Urban Giraffe blog has released a neat plugin that handles all of this for you. Their 301 redirection plugin makes it insanely easy to add custom redirects. I’d thought of writing a plugin like this before, but it looks like they beat me to it. Take a look.